Dua Lipa is the famous songstress from Kosovo, she is everyday part of the media. Her beloved Isaac Carew, who is a model and culinary chief, became even more known after started a relation with Dua Lipa. 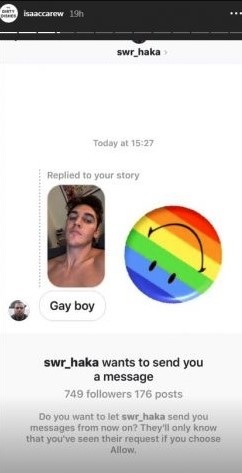 Thus, in a selfie published by him recently on Instagram, a fan called him gay, while Isaac reacted in a very interesting manner: He has published the person's comment, and has put in its background in an upside-down manner a multicolored emoji, a symbol of the LGBT community. We recall that Isaac has been very supportive of Lipa, and whenever she visits Kosovo, he comes along with her.